European Council President Donald Tusk (from right), European Commission President Jean-Claude Juncker and Austrian Chancellor Sebastian Kurz hold a news conference after the informal meeting of European Union leaders in Salzburg, Austria, Sept. 20, 2018. An ambitious plan for a European Union Border and Coast Guard force was unveiled at a special meeting of the European Council in Austria this week. European Commission officials have told VOA that they want the project approved before European elections next May, in which immigration is expected to be a central issue. The project is being pushed by the EU's current rotating president, Austrian Chancellor Sebastian Kurz, who used the summit to criticize southern European countries for failing to fully register immigrants entering through their borders. He said that EU officials who didn't work directly for any state might be less susceptible to "distractions." While officials meeting in Austria doubt that the border force plan will go into effect with the speed and reach suggested by the European Commission, a senior Spanish diplomat says that EU leaders "have to give the impression of advancing on immigration control and that some steps will be taken towards creating of a joint border force as long as it's flexible and complimentary to member states." Long-standing suggestions for a joint border force have gained urgency recently as differences on dealing with the ongoing influx of immigrants threatens to divide the EU and generate support for populist and nationalist politicians running on anti-immigrant planks. Spain's Foreign Minister Josep Borrell arrives for a cabinet meeting at the Moncloa Palace in Madrid, Spain, July 6, 2018. 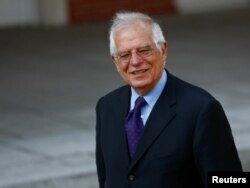 Spanish foreign minister Josep Borrell said this week that the future of European integration rests on developing a joint policy on immigration. Forming a border force to give teeth to the EU's understaffed and underfunded border control agency would further the goal, according to European Commission president Jean Claude Junker. He has asked for $1.5 billion to be budgeted over the next two years to reinforce Europe's main border control agency FRONTEX with a standing force of 10,000 guards capable of responding to new emergencies. Based in the Polish capital Warsaw, FRONTEX has until now operated as a coordinating and information exchange mechanism between European security services. Its capacity to engage in prolonged field operations is limited by its dependence on voluntary contributions from individual government. A member of Frontex touches a migrant child, intercepted aboard a dinghy off the coast in the Strait of Gibraltar, after arriving on a rescue boat at the port of Algeciras, southern Spain, July 21, 2018. Junker has warned of growing migration pressures from Africa, which, he said, could soon hold 25 percent of the planet's population. EU analysts also fear a new flood of refugees from Syria as the Assad regime threatens an offensive against the last major rebel stronghold bordering Turkey. "I want a standing corps of 10,000 in place by 2020 ready to support the over 100,000 national border guards in their difficult tasks. We need to establish a genuine, efficient EU border guard — in the true sense of the word. For this to happen, we also need equipment. We need more planes, more vessels, more vehicles," Junker recently told the European parliament. A legislative proposal issued on Sept. 12 by the European Commission projects an eventual budget of $15 billion over seven years beginning in 2021, to establish a network of surveillance centers, frontier check points as well as permanent sea, air and land patrols which would be armed and equipped with latest technology. The plan contemplates "dynamic" border protection by which the EU force would be deployed and moved around "hot spots" as requested by member states, as well as exercising a degree of "executive powers" in responding to emergencies "autonomously." The force would also be tasked with the removal of migrants who do not qualify for EU protection under existing international treaties, according to the European Commission briefing presented at this week's summit. Some EU governments such as Italy have been seeking the creation of "regional platforms" in third countries for returning migrants. Officials tell VOA that while setting up such facilities is not contemplated as a border force mission, the return of immigrants to countries outside Europe is the type of task which an EU unit might perform more effectively than single governments. Pressures for a border force follow a series of immigration crises over the past year which have seriously tested European unity. In his speech before the European parliament last week, Junker referred to an episode in which Italy defied the EU by refusing entry to a ship ferrying African migrants. He blamed the incident on a lack of mutual "solidarity" which could have been resolved with a common coast guard to direct the ship. African immigrants celebrate as they enter the immigrant center CETI in the Spanish enclave Ceuta, after some 200 refugees crossed the border fence between Morocco and Ceuta, Aug. 22, 2018. Spain expelled 166 African migrants who forced their way through border fences with Morocco over the protests by EU officials while Austria and Hungary have similarly engaged in unilateral expulsions and closed their borders in defiance of the EU Shengen treaty. Distrust of Europe's ability to police frontiers was also a factor in Britain's decision to "Brexit" from the EU through a referendum two years ago. An EU immigration expert working in Spain's foreign ministry has told the VOA that creation of an EU Border and Coast Guard will probably gain support in a series of meetings between interior and justice ministers over the next few months. But the proposal put forward by Junker is likely to undergo major changes before it goes up for a vote before the European parliament, according to the source. A summit between EU, Arab and African governments to further cooperation on immigration is being held in February according to European Commissions' high representative for foreign affairs and security, Federica Mogherini. An EU force composed of security units from different member states is already operating in the Sahel region of northern Africa.